Latin music devotees have been searching for the successor to the queendom previously governed by Celia Cruz. There have been a number of vocalists touted as the next empress but alas no popular acclamation has been enjoyed by anyone. Some of us think Lucrecia has a credible shot. Lucrecia Pérez Sáez was born in Havana but now makes her home in Barcelona, Spain. As a pre-teen Lucrecia was convinced that music was fate. She began formal study before she was ten and by the time she was a teenager she was winning contests in Cuba. She attended major music institutions in Cuba and was the pianist and lead vocalist in Anacaona, Cuba’s celebrated all-female music ensemble. Once when she was touring Mexico, someone gave her a Celia Cruz LP. Although Cruz is internationally known as the queen of Cuban music, Lucrecia had not heard Celia Cruz before that moment. Of course, Lucrecia fell in love with Celia. It was a significant moment with concordances and confluences which were then not totally apparent. 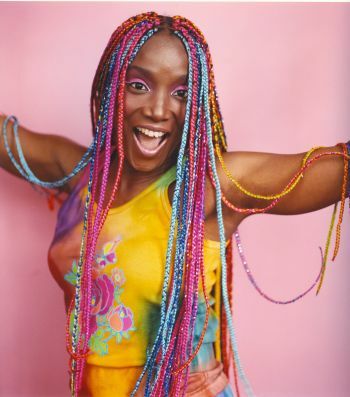 When Lucrecia left Cuba and took up residence in Spain her musical career took off with concerts, television appearances, movies and even a recent children’s book, Besitos De Chocolate. Cuentos De Mi Infancia [Little Chocolate Kisses: Stories from my Childhood]. But it was an original movie score that brought Lucrecia to a similar political position as Celia Cruz. The movie was the documentary about exiles who left Cuba on rafts, Balseros. For the soundtrack Lucrecia composed some of the music and sang. Included on the soundtrack was Juan Pablo Silvestre’s “La Noche de la Iguana,” which was sung by Lucrecia and subsequetly became one of her most popular and politically charged recordings. “Iguana” was dedicated to oppressed people worldwide. Although the song does not specify the Cuban government, lyrics such as ‘’For my people who tell the truth day after day and their words are always silenced . . . ya amaneció (it has finally dawned),'’ make clear what she means. Moreover, her latest album, Album de Cuba, a realization of pre-revolution Cuban music, won a Grammy nomination for album of the year. The arrangements are superb and her interpretations are sonic post cards both about and from an earlier era. Currently Lucrecia has been selected to recreate Celia Cruz for a musical in Spain. At one of Lucrecia’s performances in Miami, Ms. Cruz’s husband gave his blessings to Lucrecia undertaking the lead. And although the general agreement is that she is the best person for the role, Lucrecia wisely notes that becoming the next Celia Cruz is not the goal for Lucrecia. "I adore Celia. She is an angel who is still with us, still with me. I can’t, even for a moment, consider the possibility of being her successor. Nobody can be. She was the goddess of Cuban music. She still is. She was great even before anybody knew it. It isn’t that she one day became great. It’s that one day people came to know her and to understand that she was great. She was born with that star. I’m just Lucrecia. I want to have the career that was meant for Lucrecia." What most entrances me about Lucrecia is her ability to perform in widely varying styles. Her conservatory, instrumental and vocal training certainly aids Lucrecia’s ability to both easily and convincingly project sincerity and authenticity in a multiplicity of styles. She can do big band smooth, jazz club intimate, stage show extravagant, and dance hall raucous with nary a hitch nor hiccup in gliding from one genre to the other. Additionally, she also arranges and produces her recordings. Lucrecia is a total, triple-threat vocalist, musician and entertainer both out front and behind the scenes. For your musical edification we present one of the leading purveyors of contemporary Cuban music: Lucrecia. Enjoy!